We hope your May started off great, and that you’re finally enjoying some warmer weather! As promised, here are important dates, reminders and helpful hints to guide you in preparing for the summer ahead. As always, if you have any questions, feel free to contact us in the office and we’ll be happy to help! If necessary, you should have already ordered from the Camp Spot Online Catalog. The Packing List is available on the Parent Dashboard, and you can find the Camp Spot Online Catalog at www.thecampspot.com. Camper Forms are past due. If you are waiting for a later appointment with your doctor for your camper’s medical check-up, and haven’t already contacted us, please let us know as soon as possible. If you haven’t already reviewed the updated Parent Handbook with new information for 2015, you should read it carefully for important information and policies. Most of the answers to your questions can be found in the Parent Handbook, which is on the Parent Dashboard. You should have received information about the Camp Echo Lake Tennis Academy and signing up for private lessons. If you are interested in signing your child up for private lessons, please click on the link in the email that we sent to you or call the camp office. You should have already received information about Optional Ice Hockey Opportunities. If you are interested in signing your child up for Ice Hockey time, please click on the link in the email that we sent to you or call the camp office. As you prepare to pack for camp, please be sure to label absolutely everything that your child(ren) will be bringing to camp. We suggest that you follow the packing list – there is no need to over pack. Keep in mind, the more that campers bring to camp, the more that they have to keep track of. If you are not currently subscribed to The Trail (formerly know as the Camp Echo Lake Blog), be sure to subscribe on our website. Our updated version of the Trail Newsletter has been posted to The Trail. If you haven’t done so already, check it out to see what we have been up to this winter! Staff – your forms are available on the Staff Dashboard. Please fill them out as soon as possible. Staff forms are due by June 1st. 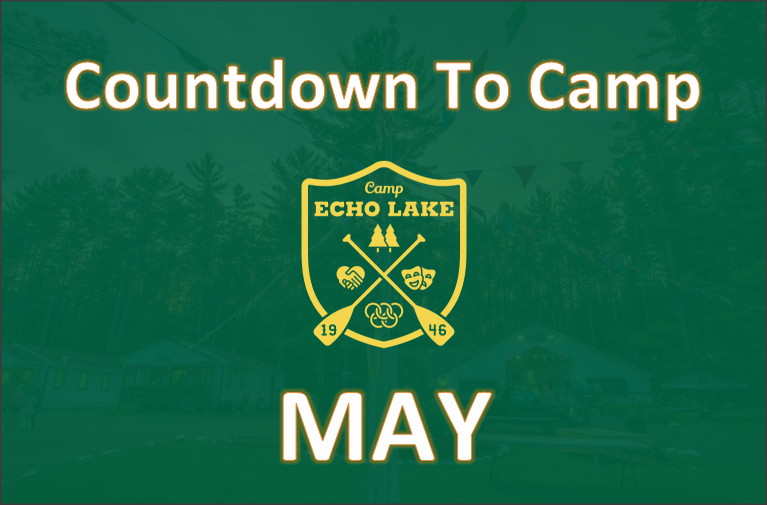 If you have any friends who might be interested in touring Camp Echo Lake this summer, please have them contact us in the office at 518-623-9635. If you haven’t already explored our new website, or watched our new videos, be sure to check it out! Be on the lookout for an email with instructions about signing up for summer phone calls with your camper. Be on the lookout for the Summer Edition of the Trail Newsletter – and be sure to share it with your kids! If you have signed up for CEL Baggage, be on the lookout for your bag tags in the mail.